Some of the men placed carnations by the body, others roses. Many struck their chests with a closed fist before touching their dead friend’s arm. One fighter had an SS tattoo on his neck. Sergiy Grek, 22, lost a leg and died from massive blood loss after a radio-controlled anti-tank mine exploded near to him. 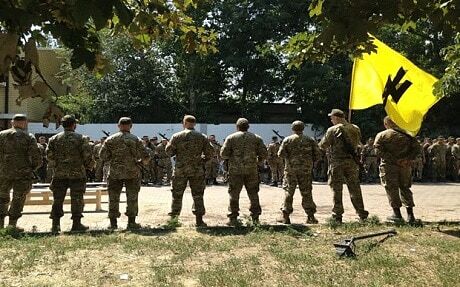 The Telegraph was invited to see some 300 Azov fighters pay respects to Mr Grek, their first comrade to die since the battalion was formed in May. An honour guard fired volleys into the air at the battalion’s headquarters on the edge of Urzuf, a small beach resort on Ukraine’s Azov Sea coast. 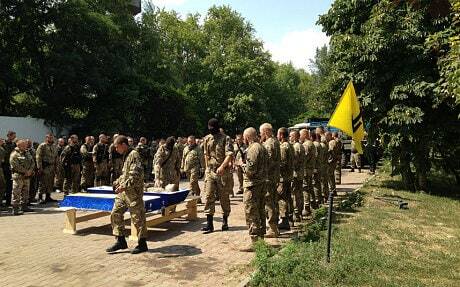 Two more militiamen died on Sunday fighting north of Donetsk <<Aug 10>>. 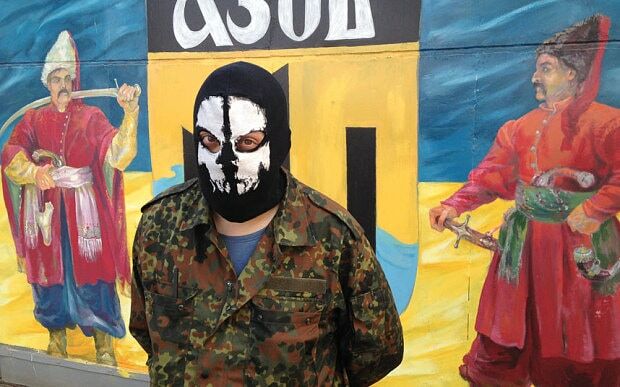 Petro Poroshenko, Ukraine’s president, called one of them a hero. Each new recruit receives only a couple of weeks of training before joining the battalion. 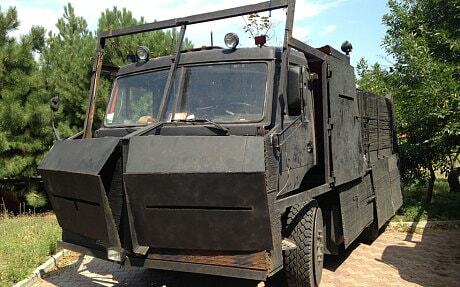 The interior ministry and private donors provide weapons. The HQ is a seaside dacha compound dotted with pines that once belonged to the ousted president of Ukraine, Vladimir Yanukovich, when he was governor of this region. Families in swimsuits with towels and inflatable rings walk past gate-guards toting automatic rifles. Such notions seem a far cry from the spirit of the “Maidan” protests that peaked in Kiev in February with the ousting of Mr Yanukovich, who had refused to sign a trade agreement with the European Union. Young liberals led the way but the uprising, which ended with the president fleeing to Russia, provoked a huge patriotic awakening that sucked in hardline groups.